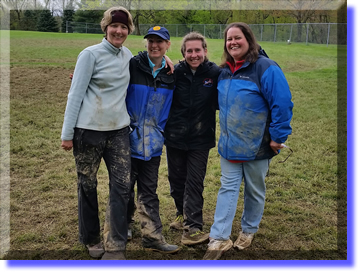 AADS Dogs Rock at the 2015 NADAC Championships! Pye, Brie and Tippet, with all their awards! 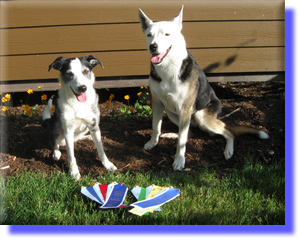 Three dogs from All-American Dog Sports competed in the 2015 NADAC Agility Championships in Springfield, IL, October 1-4, 2015, and all three were finalists! 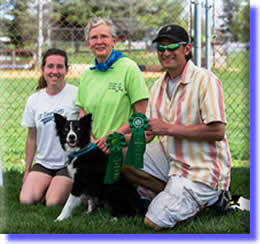 Jennie Jones and Tippet had some awesome runs, including a couple of 1st places, in the 8" vet dog division, and finished in 4th place. Tippet also finished her NATCH2 while at Champs! Congrats! Andrea Lengi and Brie finished in 2nd place in the 12" standard division, and also finished NATCH6 with their run in the finals, and Andrea Lengi and Pye finished in 4th place in the 16-20" standard division. 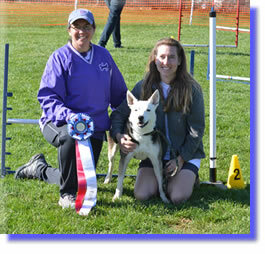 Pye also won sponsored awards for the High Scoring All-American Rescue Dog and the High Scoring Cattle Dog/Cattle Dog Mix. 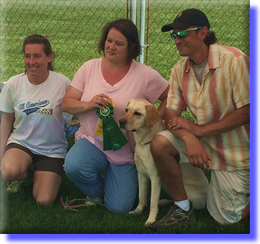 AADS May 2015 NADAC Agility Trial Report! Biscuit – 1st Q + 1st Place! 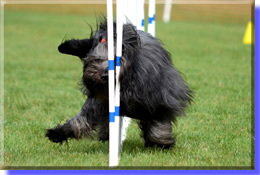 AADS April 2015 NADAC Agility Trial Report! OK, so the weather wasn't exactly perfect this time around. It was cold and rainy most of the weekend. And we had a few stressful moments while getting things under way. But despite the rain and other issues, the trial went well and the dogs and people still had a great time! Thank you to our judge Ed Scharringhausen, who was a great sport and stood cheerfully out in the rain all weekend, and thank you to all the volunteers who kept a great attitide all weekend and kept everything running smoothly! Sapphire - 1st open Reg Q! Echo - 1st Q in NADAC! Elijah - Novice TouchNGo - 1st Title! Coco - Open Tunnelers Outstanding! Leanne Brownlee-Bowen took lots of great pictures at the trial - you can see them here. If you see any photos of your dog that you would like a copy of, feel free to email Leanne! 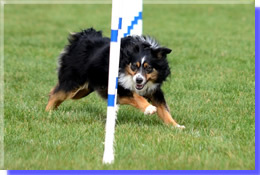 AADS October 2014 NADAC Agility Trial Report! We had almost perfect weather and lots of great performances! Judge Bernie Doyle brought some fun and sometimes challenging courses, and the weekend culminated with the much-anticipated "Battle of Blacksburg" in tunnelers, which kept everyone in suspense as David Burnette and SadieL beat Mary-Ellen Burnette and Rally's time, only to get beaten by Mary-Ellen and SeeYa! Jazzy - Novie Superior Versatility! Coco - Novice TNG, Open Tunnelers, and Open Reg titles! Emmy completed more than 1/2 a course! Quinn - Open Weavers title and 1st place! Squeaker - Novice Superior Versatility and Novice All-Round! Mac - first Jumpers and Tunnelers Q's! Karma - Novice Weavers and Jumpers titles! Jet - 1st Q ever! Leanne Brownlee-Bowen took lots of great pictures at the trial - you can see them here. If you see any photos of your dog that you would like a copy of, fell free to email Leanne! UCD Brie and UCD Pye! 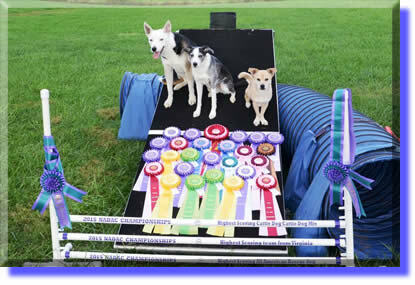 Brie and Pye both finished their UCD titles at the K9 Konnections UKC Obedience trials on May 31 and June 1, 2014. 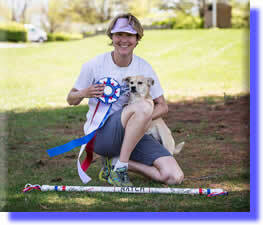 Jennie Jones and her awesome little dog Tippet finished their first NATCH at our own All-American Dog Sports trial April 27, 2014 with a very exciting Chances run! What a great team! Celeste Crisman and Luke: First trial, several Q's! Cathy Wyatt and Rosie: WV-E 600! Jennie Jones and Tippet: NATCH!! Wendy Biggs and Leah: Novice Regular Title! Leanne Brownlee-Bowen and Annabelle: First title! TN-N! Cindi McKenzie and Mac: First trial, first jumpers! Congrats to everyone on your accomplishments! 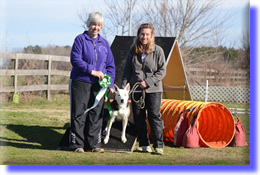 Pye finished his first NATCH at the Tails Up NADAC trial in Chesapeake, VA on Feb 22, 2014, and quickly followed it up with his first Versatility NATCH at the Star City Canine Club in Roanoke, VA on March 22, 2014.